A contract takes place when two or more parties agree to the same terms and conditions at the same place and at the same time. When do you need a contract? Contracts are used in different business transactions that are either big or small. 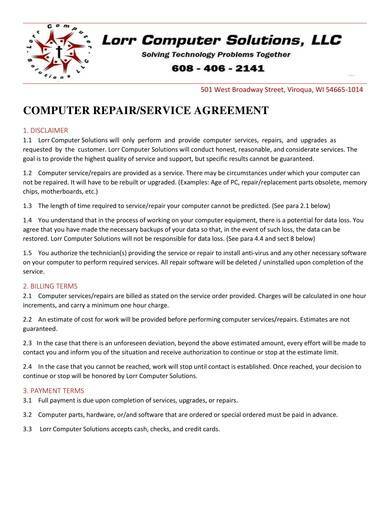 If you run a computer repair and maintenance business, you would need a contract to lay out the terms and conditions of the services that you will be providing to your clients. 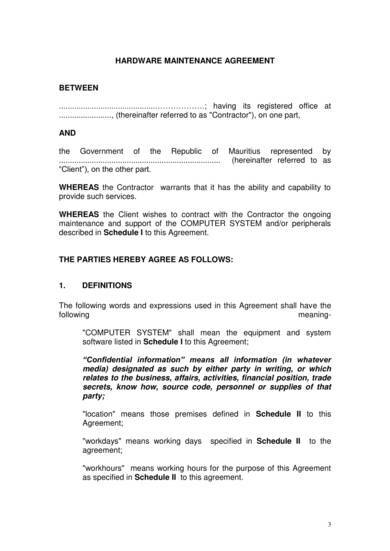 Service contracts such as a computer service contract plays an important role in a business transaction as it documents the agreement that took place between the client and the service provider. Here, we will provide you with steps on how you can easily write your own computer service contract. 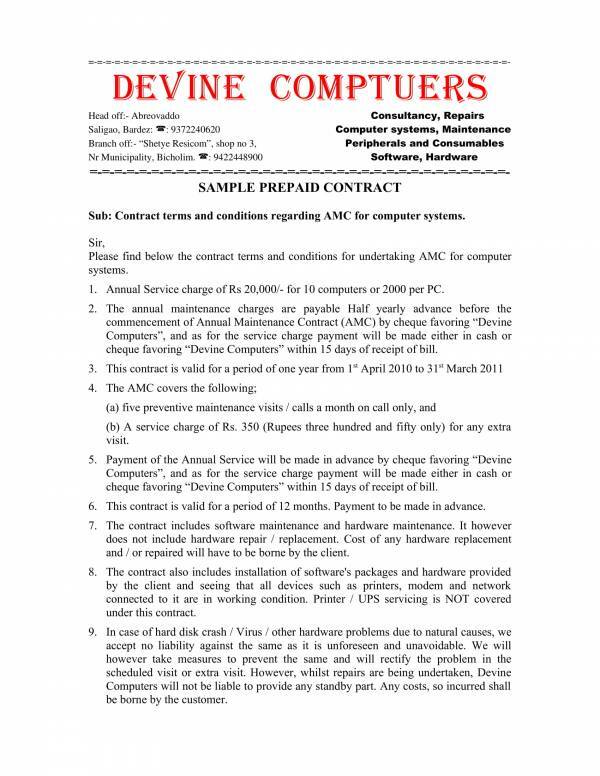 We have also included service contract samples and templates that you can use as reference. 2. Provide your product or service details. 3. Outline a payment schedule. 5. Personalize your service contract. A well-written computer service contract is all you need to ensure that you are doing the right thing in business. For your contract to become truly effective, it must be clearly written and understood by both you and your client. How can you do this? Here are simple steps that we have prepared to help you write an effective computer service contract of your own. Your contract should clearly state the people or entities who are involved in the transaction. Their complete and correct names should be stated in the contract to ensure that the right people are being bound to it. The client and the service provider should be also be clearly identified. This is an important first step when creating a contract. List down the services or products that your business has to offer, especially those your client wants to take advantage of. This is so that things are clear for both parties on what work or job is to be done and provided. The payment schedule or payment frequency is another important part of the contract. In this section you should clearly state the dates or how often the client needs to make a payment, as well as the mode of payment you both ave agreed to use for the transaction. Protect your business or trade secrets by having a confidentiality clause and other applicable clauses included in your contract. The confidentiality clause will prevent disclosure of important agreed upon terms or transactions that took place between the service provider and the client. Add terms and conditions or sections in your contract that are applicable to your way of doing business. Just make sure that it is something acceptable and not against the law. This sample makes a wonderful computer services contract. It has a unique business logo and a catchy tag line written just below the logo. The sample consists of sections that are written in bold for easy identification and only takes up two pages. It is detailed but not too lengthy like other contract documents. The different sections and subsections in the contract are numbered, which includes the disclaimer, billing terms, payment terms, liability, support, repairs and service guarantee, etc. 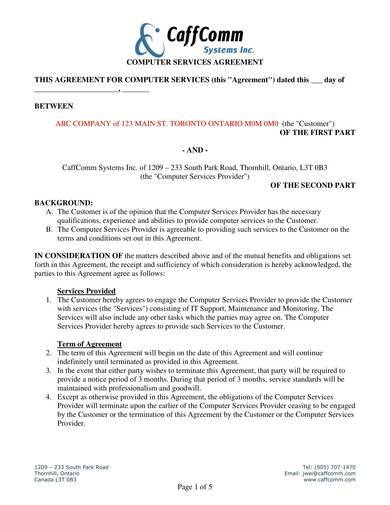 The printable computer services contract sample is another contract sample that you should check out. The name and logo of the computer company is placed visibly on top of the page followed by the terms and conditions of the contract. The sections in this sample are written in red capital letters making it very distinguishable from the other texts. Looking a for a contract that is not too short and not too long but still has everything about computer services covered in it? 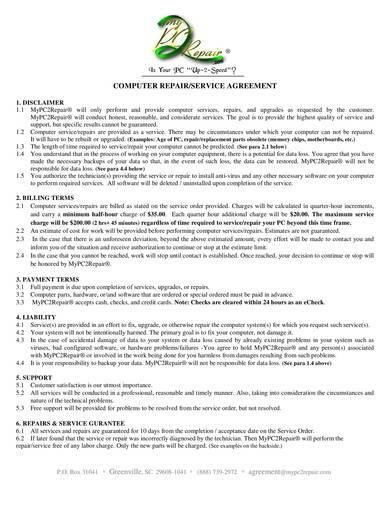 Well, look no more as this detailed computer services contract sample is what you have been looking for. 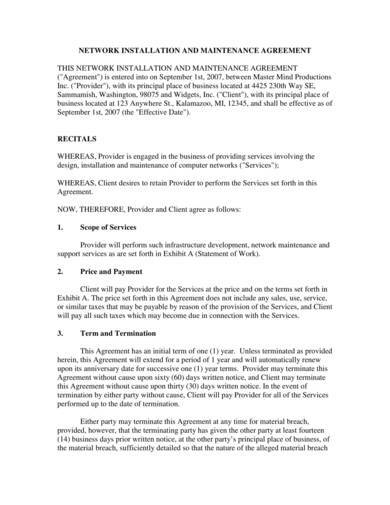 This is a full six-page contract sample complete with all the details that are necessary in a contract. When a contract is prepaid, it means that the contract has been paid for even before the services were started. Prepaid contracts are common in Internet service providers and telephone or cell phone service providers. You pay for the services first before you actually get to use it. The sample computer services prepaid contract above is perfect if you need a guide or reference in writing a prepaid computer services contract. This sample contract above includes a description of the scope of services, price and payment, term and termination, obligations of client, confidential information, etc. It follows a format that is commonly used in contracts and consists of 17 sections in total. The contract sample also has a separate page dedicated for the statement of work and a change request form. If you need a really good contract for your computer software, services, and equipment, then you need one that is prescribed or recommended by the authorities. 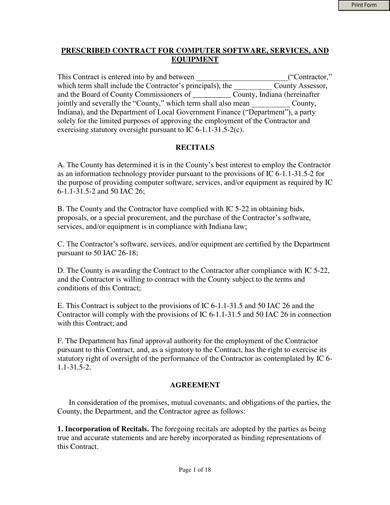 The sample above is one that is used in the county in Indiana and the Department of Local Government Finance. The last page of the sample is dedicated for writing the names and signatures of the parties and witnesses involved in the contract. If your computer business offers expertise in computer hardware maintenance, then you might want to take a look at this sample computer hardware maintenance agreement contract. You can use it as reference or as a guide to help you write your own contract. Need more references? You can always check out other contract samples and templates to help you write your own. You can get many different ideas from contracts, like personal service contracts, maintenance services contracts, and residential service contracts.